When planning your wedding, you should consider everything from start to finish. Your wedding album will begin with pictures of the wedding party getting ready, but have you ever thought how to finish it? Running through a cascade of sparkles while your guests hold their sparklers in the air will be a wonderful statement as you begin your life with your new spouse. Guests will have a great time with it too because who doesn’t love sparklers? It will be the perfect end to any wedding day and will have guests remembering your wedding for years to come. The key is letting your guests know what time you intend to leave so that more of them will stay for the sparkler finish. For example, you might have a sign at the entrance to your reception along with the boxes of sparklers you want to buy. Take your guest list and assume that only about 75% of them will stay to the end. Then buy enough sparklers for each guest to have one to two. Once you’ve done those calculations, you can safely buy the sparklers you need for your reception. Just make sure your venue is okay with the use of sparklers! The best place to buy those sparklers has to be Wedding Day Sparklers. 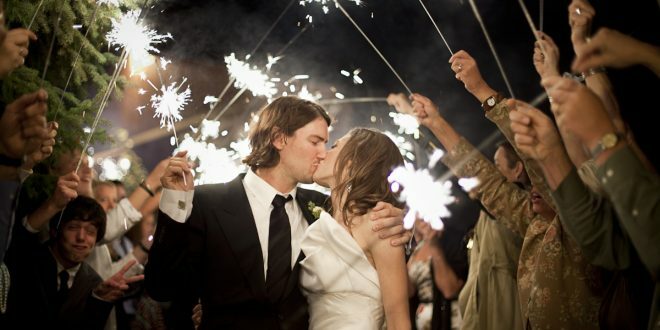 Their 20-inch wedding sparklers are built to last up to two minutes. You can buy sparklers from 1 sleeve (8 sparklers) to a full case (288 sparklers). That should ensure plenty of time for getting the perfect photo as you and your new husband leave the reception. The sparklers are made of steel wire and therefore smokeless, as it will allow for photos without a misty haze. They are even great for making shapes and writing in your photos. Guests can wave the sparklers about in the shape of hearts or the word love, for example. There will be plenty of time for the photographs you want and to end the day in style.